In the past 10 months, there have been two films about the Boston Marathon bombing of 2013: Peter Berg's intense PATRIOTS DAY and now David Gordon Green's STRONGER. While these two share basic subject matter, they are very different from one another. PATRIOTS DAY focused around the bombing itself and the manhunt that followed. 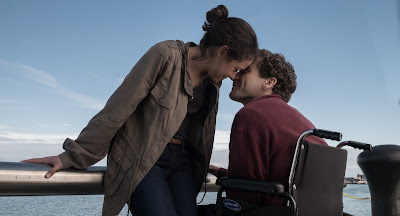 STRONGER has a brief scene of the bombing but mostly focuses around the physical and psychological effects it had on Jeff Bauman (Jake Gyllenhaal) and his girlfriend, Erin (Tatiana Maslany). Jeff was standing next to one of the bombs when it exploded, causing him to lose both of his legs. In the ensuing months, Jeff struggled with the trauma of the incident as well as the unwanted heroic designation his city gave him. Structurally, STRONGER is another inspirational film about a man struggling with adversity. However, largely due to Green's sensitive direction and careful handling of the love story at the film's center, STRONGER is elevated above other films of its kind. This isn't a "greatest hits" version of Bauman's story - Green isn't interested in that. He immerses the audience in Bauman's life and world, choosing to treat the more triumphant moments with equal importance to the smaller ones such as when Jeff and Erin sit on Jeff's roof enjoying each other's company - a rare moment of calm. Bauman isn't depicted as a hero. He is a flawed human being whose irresponsibility and consistent drinking are amplified by the trauma of the bombings. It is to the credit of Green and screenwriter John Pollono that Bauman's personal troubles aren't glossed over and that he isn't depicted as the hero that he never wanted to be. With Jeff's overpowering yet loving mother (Miranda Richardson in yet another performance that proves why she's one of the most versatile actresses working today) straining his relationship with Erin and his increasing reliance on alcohol, Jeff's life takes a downturn, plunging him to new lows. Jeff bounces back, but when he does, it's treated as a series of small triumphs, not one large moment of triumph where the music blares and the camera swoops. Gyllenhaal and Maslany individually give performances of quiet power individually while complementing each other together. The internal torment and physical challenges that affect Jeff throughout the film are brought to life with a sense of dedication, dignity, and realism by Gyllenhaal. There's never a moment when this performance feels like a performance. Erin is Jeff's rock and his most consistent support and Maslany conveys this with grace and subtlety. Watching Gyllenhaal and Maslany track the highs and lows of Jeff and Erin's tumultuous yet committed relationship form the emotional core of this film, keeping the audience consistently engrossed and engaged. Overall, Stronger is a familiar story told with skill and a genuine sense of care. There's a good chance audiences will dismiss this as either another inspirational drama about overcoming the odds or another Boston Marathon bombing movie which would be unfortunate, as this is an unexpectedly unconventional film that could inspire not through contrivance and cliché but rather through the sheer integrity and perceptiveness of the work of those who made it.